Etrian Odyssey III is a game that is not kind to anything that's not a Hoplite or a physical attacker. Zodiacs had the unique misfortune of being not just an elemental attacker, but a TEC-based one at that. The TEC damage formula causes those attacks to fall off damage-wise towards endgame, and elementals have very little support. In the early game they can use Dark Ether to cheese a good portion of the game, and at the end they can swap to Meteor over the elementals to take advantage of physical damage buffs, but other than that the game did not extend much help to them. They're better in Nexus. While still not on the level of classes like recent Alchemist incarnations, Runemaster or Warlock, Zodiac's damage with elementals has been shored up, and their old standby Meteor still performs marvelously. Their support abilities are about the same, but they've gained several passives to improve their fighting ability. They're also capable encounter clearers; if multiple enemies have a weakness, a single Binary will typically either demolish everything, or leave survivors low enough to be quickly picked off. Though later on their damage falls off a bit due to poor scaling, this is nowhere near as sharp as in EO3, leaving them as perfectly capable damage dealers against single targets and incredible sweepers against crowds. For 3 turns, Zodiac skills have their damage increased by 40%, and will refund 50% of their TP costs after use. It's a damage-increasing Force Boost, but it makes Zodiac's TP go slightly farther. The refund part is important, since that means it doesn't interfere with Etheric Boon. While it looks pretty boring, Zodiac's charging playstyle pretty much lets you get four turns out of it, so it's definitely one of the better Force Boosts out there. Deals ranged INT-based fire + ice + volt damage to all enemies. On the turn of use, all party members' TP costs are reduced to 0. Encounter clearer with a little bit of utility. Doesn't benefit from either Etheric Charge or Multi-Strike Either, and doesn't activate Etheric Boon, so if you're thinking about using it in a boss fight, think about it a little more. It doesn't count as an Astrology skill, so it doesn't work with a lot of Zodiac's own passives. However, it does work with prophecies' damage boost, so if you know a boss's pattern intimately and time it right, your Zodiac can do some really devastating burst damage. Increases one row of party members' elemental attack for a set amount of turns. Etheric Gleam is a decently powerful buff, though it is thoroughly unimpressive on its own when compared to Attack Order. If you don't have any other party members providing buffs, and have multiple sources of elemental damage, feel free to invest in it. Otherwise, I wouldn't bother. Same total damage increase as Attack Order, but slower, more expensive, just as lengthy and only works on elemental attacks. With the right party composition, can be used to skip Attack Order entirely, not really useful otherwise. Deals ranged INT-based fire damage to one enemy, with splash damage. The hardest-hitting Novice Zodiac skill. Not saying much, but still. Since you're gonna take all of them to take advantage of Singularity, just sort of...invest in the Stars depending on whatever element the next boss you're gonna fight is weak to. In fact, I'm not gonna give commentary on the next two skills, since they're about as exciting as Fire Star. These skills scale really terribly. Unless you plan to max the Stars for bosses (instead of Binaries or Meteor), you'll probably want to leave them at a low level and primarily use them against mobs. Personally, I prefer maxing the Binaries for bosses (and emergency situations in randoms) and leave these at prereq. Splash damage is okay for crowd control. You're hitting one target harder than the others. That's inconvenient, though, because you only get Singularity and decent damage in general if each target is weak to Fire, which doesn't always happen. Man, it bothers me that they have different targetting. It made sense for Runemasters, because they went all in on asymmetrical targetting types and could just use their favourite one by manipulating enemy resistances. But Alchemist, Warlock and Zodiac getting them makes no sense because they get stronger, equally-powerful all-target versions! Huh? Oh. These are weaksauce. I don't bother with them even for randoms, unless I'm trying to gently poke something to death and my Zodiac is the only one able to act. Useful in the early game, then you get the TP to field Binaries and by that point you just Binary. Deals ranged INT-based ice damage to one enemy, with line-piercing effect. This is pretty much the worst out of the Stars, with lackluster range and average damage and speed. No reason to use this beyond its element. Even rarer than having three Fire-weak enemies next to each other is having two Ice-weak enemies, one behind the other. I hate Ice Star so much. Deals ranged INT-based volt damage to one row of enemies. Volt Star is a really fast skill, and sometimes against enemies who are weak to all elements, sometimes this allows your Zodiac to outspeed and defeat them before they get a turn, while Fire Star won't. It also has the most convenient range, so it's the eaiest one to use on neutral mobs. Surprisingly, a whole line of Volt-weak enemies is fairly common. As a result, Volt Star will probably be your go-to AoE before you jump to the Binaries. Increases damage dealt when hitting an enemy's weakness. Singularity is absolutely crucial to keeping Zodiac's damage competitive. Get it and max it out as soon as you can. Yeesh. This turned from a really strong passive to something that's barely better than a typical damage passive when it activates. You'll still want it eventually, but outside of the first point it's hardly a priority any more. Until the end of the next turn, Zodiac skills will only hit one enemy, but will deal increased damage. Etheric Charge is how Zodiacs buff up their damage for when they only need to hit one target--say, a fight against an FOE or a boss. At level 3, it's DPS-neutral (Etheric Boon aside) and from level 4 and on, it's a DPS gain, so...yeah. Worth using. When the user kills an enemy, their TP is restored. Too small a restore to be useful. Unless you can blow up a bunch of enemies at once with a Binary. You don't even need to put all that many points into it for that to happen. It makes maxed Binaries comically efficient, especially if every enemy in the encounter shares a weakness. This is comically bad on a damage-dealer class. While you unfortunately need to drop three points in Horoscope to level up Meteor, I would not level it up at all besides that. This is the only encounter reducing skill you have access to before Veteran, so if you're using Memory Conch to level your farming party (as oppoased to using the experience DLC or Alice), then you're going to want to create an extra Zodiac for this skill alone. On your main Zodiac... eh, could save you a Ward Chime every now and then? Sometimes they're handy when you need a peaceful walk to a boss or can't figure out a puzzle or something, and if you're going for Meteor it's not like you're spending any extra SP on it. meanwhile, scorpios: watch your back. Increases the damage dealt by Zodiac skills. It's a passive damage buff! One point for a persistent 5% damage buff isn't...bad? After that, grab more levels when your attack skills are leveled up to where you want them. It's the typical attack passive, except instead of being restricted by elements, this one is restricted to Zodiac skills. Take it when you're done with your main skills. Deals ranged INT-based fire (Binary Fire), ice (Binary Ice), or volt (Binary Volt) damage to all enemies. The encounter-clearers! You'll definitely want these, but good lord keep a close eye on your Zodiac's max TP relative to how much the skills cost. If your Zodiac is not using Meteor for bosses, then they'll want these. Multi-strike Binary hitting a weakness does slightly more damage than a Multi-strike Meteor hitting neutrally, but costs way more SP to get online. The TP cost increase from maxing them is actually not very relevant because they're too expensive to spam in randoms even at level 1, but you'll still need to use them in emergencies. I spam them in randoms and make it out just fine. Maybe I'm just too used to making short trips. Do most people make really long trips? Increases the user's damage dealt based on how much TP they spent last turn. 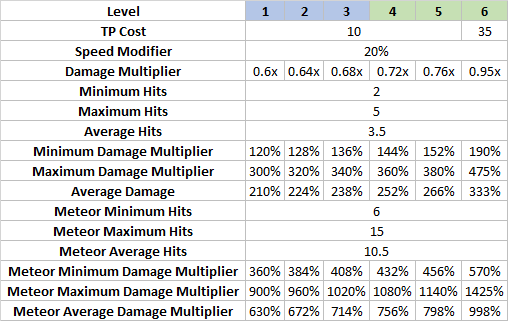 The formula for the damage increase is: ((TPSpent ^ 1.5) / 10) * SkillValue. 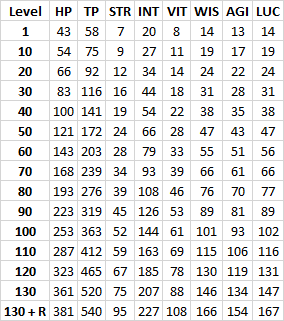 A table of Etheric Boon's effect at various levels, with various rank 10 skill TP costs, is provided below. Mmmmmnnnnnngggghhhh Etheric Boon. I want to like it. It's a good concept for a skill. But gods it's severely undertuned. The Prophecies provide a very weak bonus, the Binary skills and Multi-Strike Ether provide decent bonuses, and Meteor provides the best bonus. But, see, the problem with Etheric Boon is that, on Zodiac, you're not going to be spamming attacks from turn to turn, and therefore, you won't get benefits from using TP on the Binary skills or, even more painfully, Meteor. For a Zodiac, the only really relevant numbers you need to remember is the one for Multi-Strike Ether and the one for Prophecies. 20% boost for 6 points isn't that bad, I guess, though 12% for prophecies is a bit on the low side. Outside of Zodiac main job, Imperials get 12% from it with max level Charge Edge and Medics get 17% for Heavy Strike, and they can get better bonuses from other subclasses. Gives the user a chance to nullify elemental attacks directed at party members in their row. A nice passive, though the low chance means it's not worth prioritizing. It can stop an elementally imbued Execution if you feel lucky. It's otherwise less useful than it sounds; most backline classes have at least decent magic defense, and Zodiac has no business being on the frontline. Reduces TP costs for one row of party members for one turn. Dark Ether is really good for, say, Imperials, who have extreme spikes of TP consumption, which means your Zodiac doesn't have to spam Dark Ether every turn, giving them time to use their own skills. It's not great for continuous use, is what I'm saying. Also it's...okay for Etheric Boon. Not great. But okay. You can also use it on Share the Wealth if you want; you're spending 30 TP on your Zodiac to save 30 TP on your farmer, and you get a chance to proc Free Energy. Probably not something you want to use in boss battles though, and Fruitful Song beats messing around with this during exploration. In all seriousness, Nexus is not like EO3 where a maxed out skill can cost like a third of a character's max TP, so there's a distinct lack of useful circumstance for this skill, unless your team has an entire row of Imperials or something. Deals ranged INT-based damage to one enemy. The damage type is determined by the user's equipped weapon. I don't get the point of Ether Shot, honestly. Low damage, low TP cost (meaning low Etheric Boon bonus), single-target. What is this for? It's something you use on randoms that don't have an elemental weakness, essentially. It's 2 TP to do non-futile damage, which is not a bad deal all things considered. It also uses the arms instead of head like every other Zodiac skill, and though head bind will still halve its damage (due to being INT-based), you can queue the skill and do a fast unbind to do full damage. It's worth noting that it can be imbued and that Etheric Charge and Multi-Strike Ether work on it, because it's an Astrology skill. I'd love to see someone do something nice with it. Nullifies fire (Fire Prophecy), ice (Ice Prophecy), or volt (Volt Prophecy) attacks from one enemy for one turn. If an attack was nullified, the user's damage dealt is increased until the end of the next turn. Excellent support skills. These completely nullify elemental attacks, which are often very dangerous, and as a nice bonus, give your Zodiac a little damage boost on the next turn. Max all of these out. Unlike Elemental Walls, these things can nullify elemental attacks even as a subclass skill, and lots of teams out there will switch one of their character's subclass to Zodiac just so they can have these for the superboss. Sadly, it takes a bucketload of SP on prereqs to get these, so using these as a subclass skill is something you really have to weigh your options against during the main game. Also beware that it doesn't get priority, and while 200% speed modifier is quite fast, it's still prone to get outsped by rare breeds. Gives the user a chance to reduce the TP cost of any skill they use to 0. If you are relying on Etheric Boon, which you probably should even if it isn't that great, DO NOT LEARN FREE ENERGY. It does not synergize with it at all, since it sets TP costs to 0 and that means Etheric Boon does not take effect. If you're not relying on Etheric Boon, feel free to learn it to potentially make your TP go a lot farther, RNG permitting. Unless you have a very bursty team or are late in the game (where Zodiac's natural TP is high enough to last through most boss battles), I still think there is value in learning it even if you're going to use Etheric Boon. It has a pretty decent chance of activating, and overall lets you squeeze way more damage out of your TP than Etheric Boon can, while Etheric Boon itself can still work if Free Energy fails to proc. At most, it's something you want to rest off against the superboss because by that point, saving TP is really no longer a concern. Until the end of the next turn, Zodiac skills will deal reduced damage, but become multi-hit targeting random enemies. If used in conjunction with Meteor, the minimum and maximum hits are altered. Etheric Charge, but a lot more costly (so a higher Etheric Boon bonus), RNG-reliant, and potentially a major damage boost. Once you have the TP to support it, absolutely ditch Etheric Charge in favor of this. Also, don't use Meteor without it. While its raw values seem like it actually does less for Meteor than Etheric Charge does (300% vs 285%), Etheric Boon will keep it ahead still unless your team has access to a lot of attack buffs and defense debuffs (it takes 180% worth of buff/debuff/passives for Etheric Charge to break even), and Multi-Strike Meteor is slightly more stable than Etheric Charged Meteor. They're both viable options for Meteor, really. And of course, it does way more for your Binaries than Etheric Charge can. Deals multiple instances of ranged INT-based bash damage to random enemies. Here it is: the ultimate Zodiac damage skill. When combined with Multi-Strike Ether. Without it, it's a bit anemic, since it doesn't get the benefit of Singularity against damn near every boss. With Multi-Strike Ether, though, hoo baby, it's a lot of hits and potentially a lot of damage. It does slightly less damage than Multi-strike Binary hitting a weakness, but costs way less SP to get online and isn't all that much weaker, and of course it completely owns Binaries on enemies that don't have a weakness, or are weak to everything. There are also some very noteworthy buffs that only increase physical damage (Bravant, Great Warrior). Unless you desperately need your Zodiac to do elemental damage in big battles, building for Meteor is usually the more practical route.